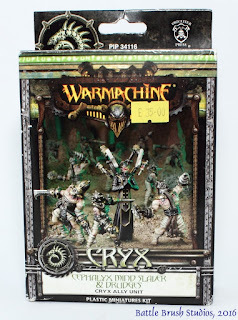 Around the end of June Privateer Press released new editions of their popular Warmachine and Hordes skirmish wargames rules.I thought it was time to take this as an occasion to review some Warmachine figures, so let's have a look at the Cephalyx Mind Slaver & Drudges box. 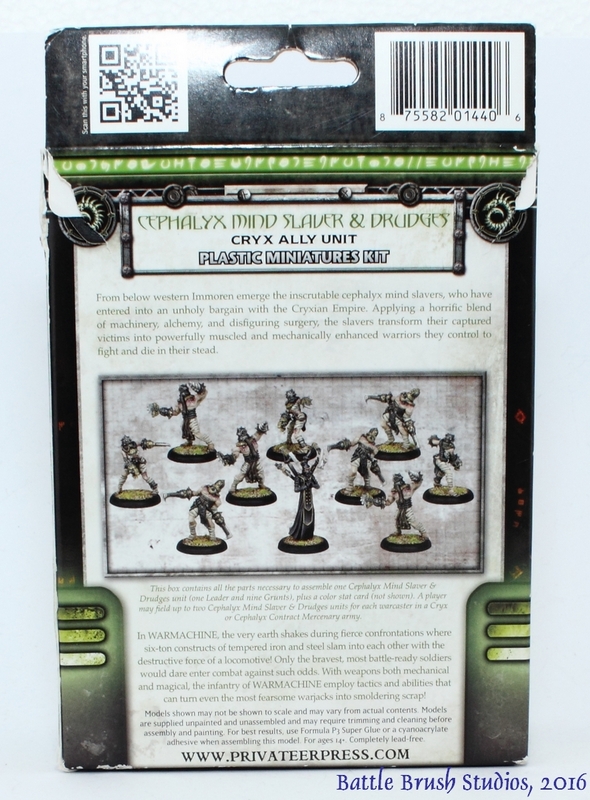 "From below western Immoren emerge the inscrutable cephalyx mind slavers, who have entered into an unholy bargain with the Cryxian Empire. Applying a horrific blend of machinery, alchemy, and disfiguring surgery, the slavers transform their captured victims into powerfully muscled and mechanically enhanced warriors they control to fight and die in their stead." Nasty guys then. But what do you expect of people who call themselves 'mind slavers'? Now that we got that out of the way I will go on to things I know about - taking all too close looks at cardboard boxes and miniatures. The box comes in an unfamiliar format: 15x11,5x5 cm. I like the design. 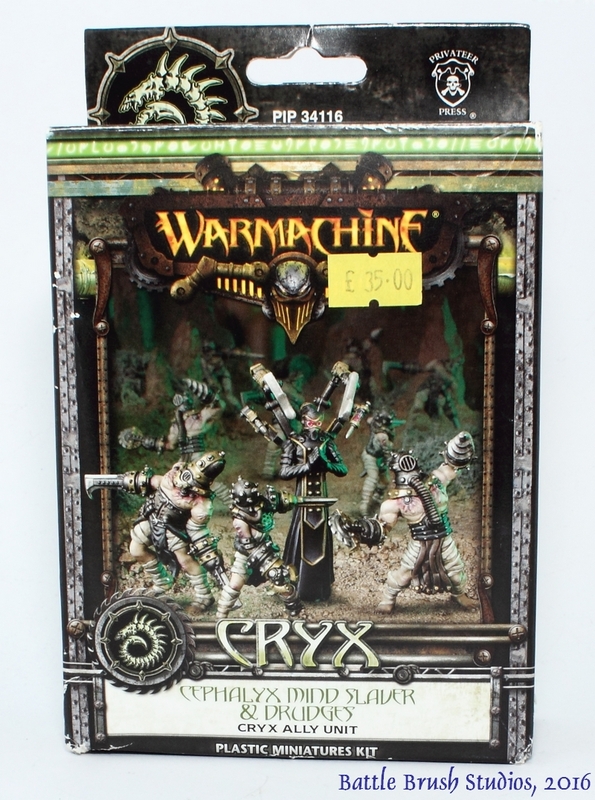 It has all the familiar Warmachine/PPP corporate design and a photoshopped photo of the minis inside. 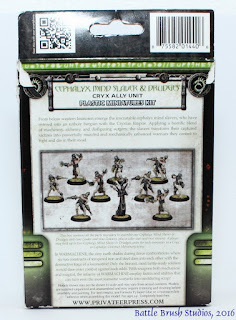 The back of the box has a clearer photo (albeit tiny) of the figures included all painted up and around it the little background blurb I quoted above, some info on what's in the box (I will get to the exact contents in a bit) and a general Warmachine paragraph thing. Now let's open it up and look inside.. 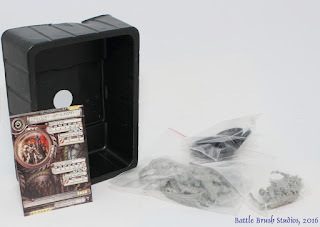 Going with the unfamiliar format of the box there's a thin plastic inlay inside. 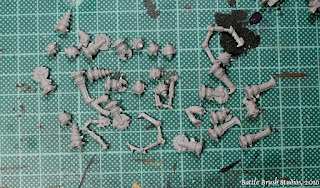 Three little baggies of bits and bases (30mm lipped round slotta bases, as made popular by Warmachine) and a full colour unit card. So this is what we get: 9 Drudges and one Mind Slaver. 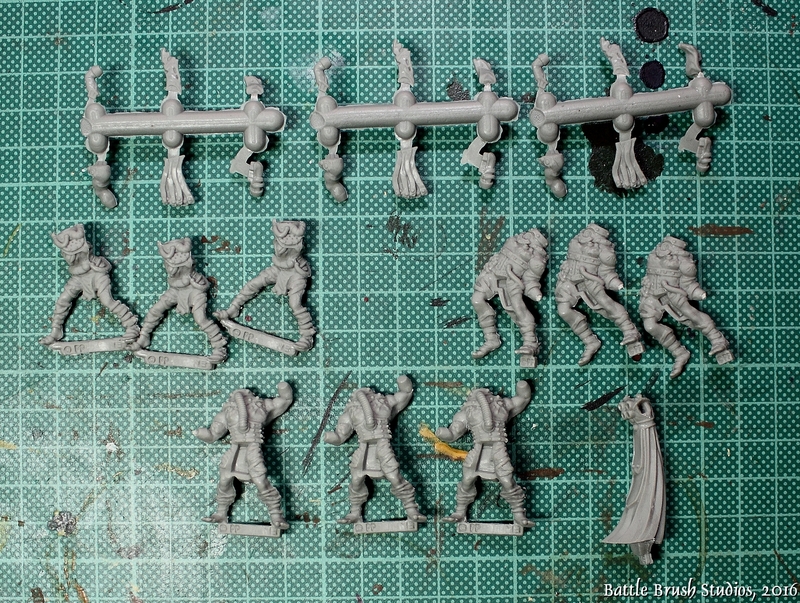 All of the figures are multi-part, most of each in one part, apart from arms/hands, heads and loincloths. The material is interesting. The box says 'plastic'. And it certainly is some kind of plastic. Just not the kind you're used to from GW stuff, Renedra and the likes. The casting quality and detailling is alright. Not as crisp as it could be, epsecially on the bandages arond the legs on the Drudges and on their feet. Mold lines are pretty much along the lines of other big manufacturers' plastic kits. The way some of them ran was a bit surprising, but oh well. Some of them running right over some small bolts with nuts on them. Removing the mold lines there is a bit tricky. The fit of the parts (once cleaned) is really good. 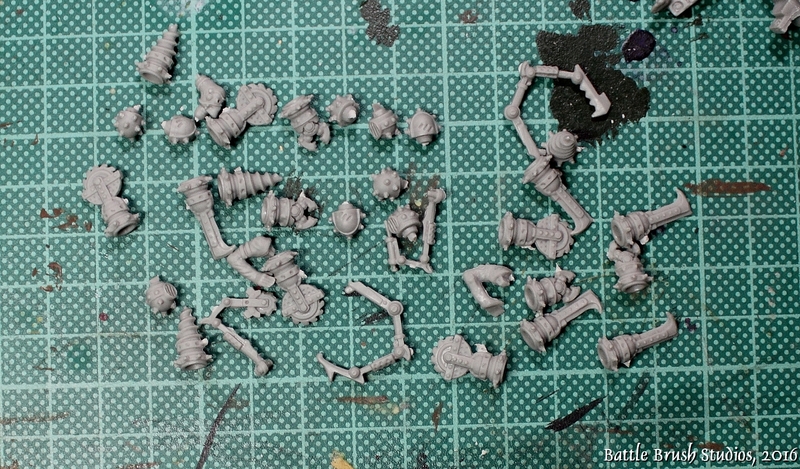 The tabs on the models had to be cut to fit left and right or had to be removed in part to fit the slotta bases. Also a bit tricky, but once you get it done the tabs click into the bases and stay there. Have some Green Stuff at hand to fill the rest of the slots (and to keep the Mind Slaver with his tiny tab in place). 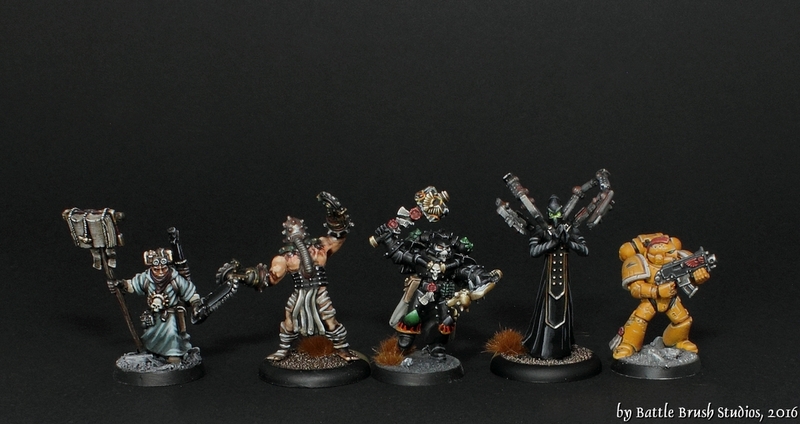 Painting the minis was rather fast and cheerful. These actually were a commission job I was ordered to make fit a force bought painted on ebay. The existing paintjob on the rest of the minis was rather basic (let's say), and I was asked to make the new minis look 'basic' as well. Which I usually don't do. I paint minis to a level that makes sense hiring a commission painter for. So I went with 'quick and efficient', but still trying to get something nice out of these minis. Which is almost trickier than doing just a 'good' paintjob. I hope I pulled it off. The minis paint up rather nicely. 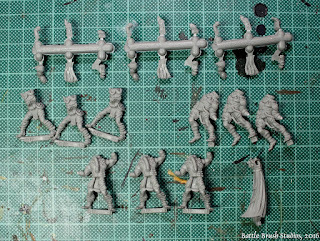 Before priming the figures I gave them a scrub with soapy water, just to be on the safe side. Well, and then I painted them. 'They paint up rather nicely', I'm inclined to say. So what do I think of these chaps? 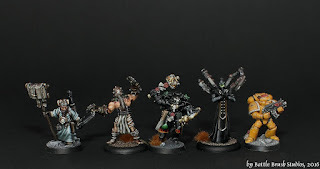 I'm not an active Warmachine player and I'm not familiar with the background, so I couldn't comment on whether or not the guys represent what they represent well. So I will stick to technical bits. The models are really tall. I would say not quite compatible with 40k stuff. ...and seeing as how the models are posed. It's almost a bit 80s/mid-90s how the figures are posed. These by the way were released in 2013 according to the tabs on the models. The technical quality is pretty good. Some details are a bit 'muddy', but serviceable. I hope that you enjoyed this review, found it interesting, enjoyed the painting and so on. If you have any questions, comments or indeed commission inquiries, feel free to let me know via the comments section, the Battle Brush Studios Facebook page or via e-mail.